Selected binders prebatched for 250 Kg/m3 - perfectly spherical virgin expanded polystyrene beads with high thermal insulating power (3 - 6 mm Ø), mixed with special E.I.A. additive which allows a perfect mix, excellent pumping and homogeneous distribution of the beads in the mix - special additives. ■ 1 m3 substrate with a 7 cm thickness. ■ Can be mixed with drill with whisk. ■ Can be mixed with cement mixer. ■ Can be mixed with mixer type “Turbomalt”. 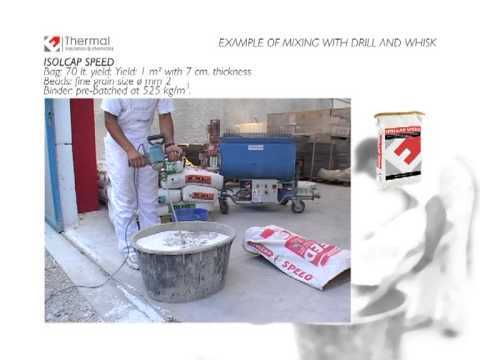 ■ Can be mixed with and pumped on site with Politerm® Machine. ■ Can be mixed with and pumped on site with Isolcap Machine. ■ Can be mixed with and pumped on site with Turbosol Pump. ■ Can be mixed with and pumped on site with truck mixer and concrete pump. ■ Bags of 70 L yield.